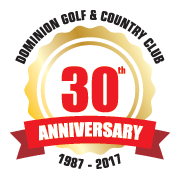 "Dominion Golf Course invites you to experience one of Windsor's oldest golf courses." 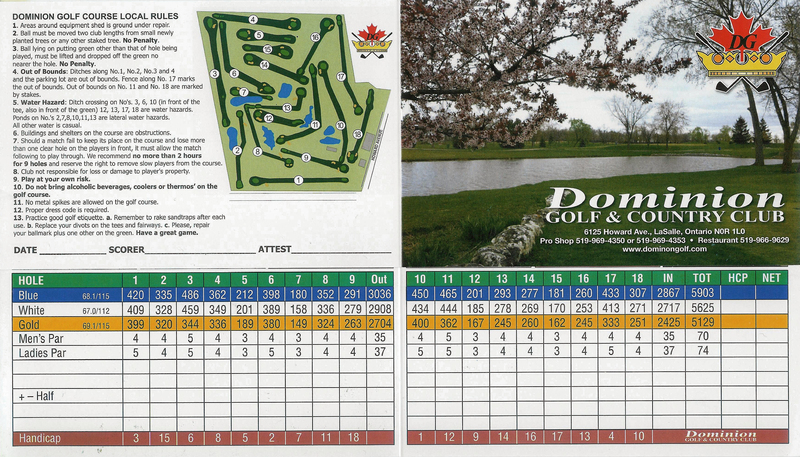 "Dominion Golf Course is located 20 minutes south of downtown Windsor, Ontario, 2 miles south of Hwy 401." All rates quoted are per person. Tax included. NEW Leagues & Tournaments Welcome! Time of play: 9 holes is 2 hours, 18 holes is 4 hours. Proper golf course attire is mandatory. Practice good golf etiquette and courtesy on the course. Repair your divots and ball-marks. Slow play is not permitted. Players must keep up to the group ahead. No walkers, caddies or riders. Remember to rake sandtraps after each use. Every player must have a set of clubs. Sharing is not permitted. ProShop does not provide rentals. Personal alcoholic beverages are not allowed. Power carts are subject to the 90 degree rule unless otherwise indicated by ProShop they are to remain on the cart path when near greens, hills, tee areas and approaches. ProShop may set "cart path only" rule, according to course conditions. Individuals misbehaving with the power carts will be escorted off the course with no refund. Golfers are responsible for damages to power carts or course. Dominion Golf will not be held accountable for lost or damage to player's property.